A newly published study details how Titan’s methane rainfall interacts with icy materials within underground reservoirs, leading to the formation of reservoirs of propane and ethane that may feed into some rivers and lakes. 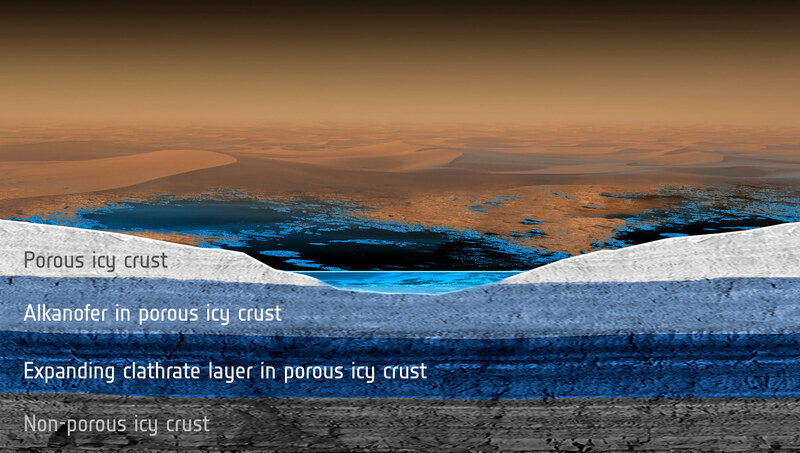 A recent study led by Olivier Mousis, a Cassini research associate at the University of Franche-Comté, France, examined how Titan’s methane rainfall would interact with icy materials within underground reservoirs. They found that the formation of materials called clathrates changes the chemical composition of the rainfall runoff that charges these hydrocarbon “aquifers.” This process leads to the formation of reservoirs of propane and ethane that may feed into some rivers and lakes. Mousis and colleagues at Cornell University, Ithaca, New York, and NASA’s Jet Propulsion Laboratory, Pasadena, California, modeled how a subsurface reservoir of liquid hydrocarbons would diffuse, or spread, through Titan’s porous, icy crust. They found that, at the bottom of the original reservoir, which contains methane from rainfall, a second reservoir would slowly form. This secondary reservoir would be composed of clathrates. Clathrates are compounds in which water forms a crystal structure with small cages that trap other substances like methane and ethane. Clathrates that contain methane are found on Earth in some polar and ocean sediments. On Titan, the surface pressure and temperature should allow clathrates to form when liquid hydrocarbons come into contact with water ice, which is a major component of the moon’s crust. These clathrate layers could remain stable as far down as several miles below Titan’s surface. One of the peculiar properties of clathrates is that they trap and split molecules into a mix of liquid and solid phases, in a process called fractionation. Titan’s subsurface clathrate reservoirs would interact with and fractionate the liquid methane from the original underground hydrocarbon lake, slowly changing its composition. Eventually the original methane aquifer would be turned into a propane or ethane aquifer. 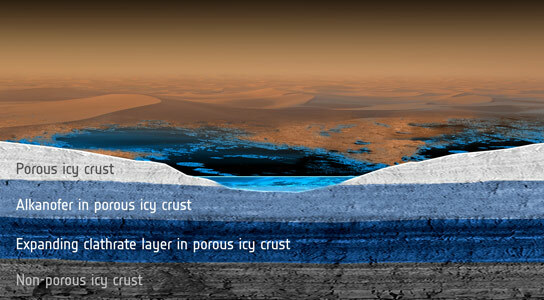 “Our study shows that the composition of Titan’s underground liquid reservoirs can change significantly through their interaction with the icy subsurface, provided the reservoirs are cut off from the atmosphere for some period of time,” said Mathieu Choukroun of JPL, one of three co-authors of the study with Mousis. Importantly, the chemical transformations taking place underground would affect Titan’s surface. Lakes and rivers fed by springs from propane or ethane subsurface reservoirs would show the same kind of composition, whereas those fed by rainfall would be different and contain a significant fraction of methane. This means researchers could examine the composition of Titan’s surface lakes to learn something about what is happening deep underground, said Mousis. The results are published in the September 1, 2014, printed issue of the journal Icarus. The research was funded by the French Center National d’Etudes Spatiales (CNES) and NASA. The Cassini-Huygens mission is a cooperative project of NASA, the European Space Agency, and the Italian Space Agency. The mission is managed by NASA’s Jet Propulsion Laboratory, Pasadena, California, for NASA’s Science Mission Directorate, Washington. The California Institute of Technology in Pasadena manages JPL for NASA. Be the first to comment on "New Research Reveals How Icy Aquifers on Titan Transform Methane Rainfall"